If you've never seen Southeast Asia by train, here's your chance. The Eastern & Oriental Express is Southeast Asia's answer to the famed Venice Simplon-Orient-Express, one of the world's most luxurious private trains transporting travellers between London and great European cities, including Venice. Filled with old-world grandeur, colonial influences and indigenous charm, the luxury sleeper train of the East offers unforgettable journeys from Bangkok to Singapore, with plenty of adventure in between. From the moment you step on board, you'll feel as though you've stepped back in time—or perhaps, onto the set of Marlene Dietrich’s 1932 film, Shanghai Express—showcasing nostalgic, glamorous and exotic adventures of the Far East. The ornate yet spacious cabins are fitted with luxurious soft finishings of Jim Thompson Thai silks, Malaysian embroidery and artisanal carpets—all ingredients for a good night’s sleep—while the private lounge and observation deck offer front row seats to the cinematic, ever-changing landscapes before you. Witness magnificent sunrises, sunsets and shooting stars, accompanied by the cacophony of birds and crickets, and traverse lush tropical jungles and expansive tea plantations. There's plenty to do on board—head to the Saloon Car's reading room to wile away the hours with a good book, or let your taste buds get acquainted with the diverse and refreshing flavours of the East with artisanal cocktails at the jazzy Bar Car. Gourmet dinners are served in the private dining area complete with white linen tablecloths. On the journey from Singapore to Bangkok, savour the rich flavours of famed Thai chef and restaurateur Ian Kittichai over a spread of modern, imaginative Thai cuisine fit for royalty. Itching for adventure? Connect with your inner Rudyard Kipling on a hill trek in Kuala Kangsar or visit a traditional village, then when you arrive in Singapore, head over to the legendary Raffles Hotel Singapore for a Singapore Sling or two at the Long Bar. When your journey comes to an end at either Bangkok or Singapore, why not continue on to other unforgettable Belmond experiences at Laos, Bali and Cambodia. Just a two-hour flight from Singapore, nestle into the serenity and privacy of Belmond Jimbaran Puri—a Balinese beachside retreat. Start the day with meditation or yoga with vast expansive views of the ocean and ravel in Balinese massages and Ayurvedic treatments by the beach. Cambodia and Laos are both just an hour's flight away from Bangkok. Belmond La Résidence D’Angkor is a blissful oasis in the heart of Siem Reap, a stone’s throw away from the UNESCO heritage site Angkor Wat while Belmond La Résidence Phou Vao in Luang Prabang rests atop the Laotian mountains in the UNESCO Heritage region, rewarding those who visit with spectacular mountain views. All aboard? 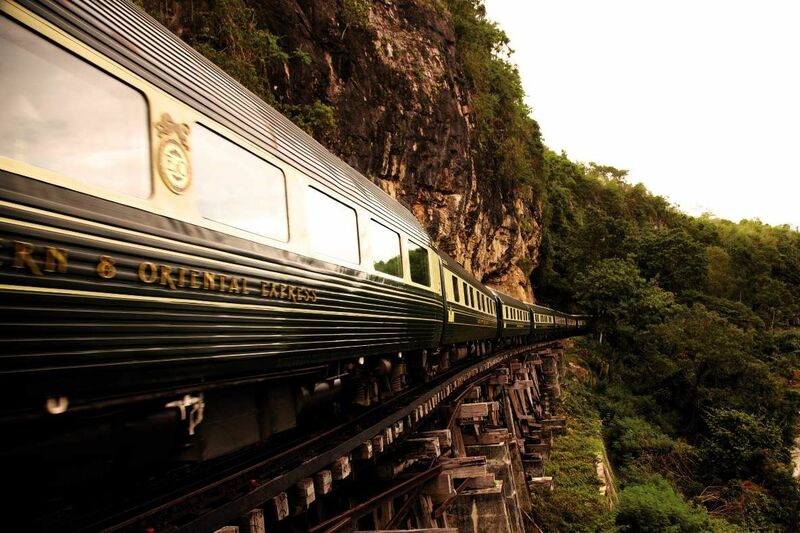 Your escapades to the enchanting Far East begin on the Eastern & Oriental Express.